We depend on electronics for many of our sim functions. Circuitry interfaces flight and engine controls, blinks annunciator lamps, and spins steam-gauge style instruments. Mostly we can find suitable off-the-shelf electronics. Sometimes we build electronics because no standard gear will do what we want. Sometimes we build electronics just for the satisfaction it brings. Usually we build using “miniature” components of the size or type that started the personal computer revolution: “DIP” integrated circuits with pins spaced a tenth inch apart and components with wire leads that we solder into holes in circuit boards. But today’s electronics is shrinking. Integrated circuits are manufactured in smaller packages that squeeze two or even four pins into the space of one. Many components have no wire leads. They are soldered directly to the circuit board surface. These so called surface mount devices (“SMDs”) depend on the solder joint not only for the electrical connection, but also for mechanical support to hold them in place. This picture shows SMDs along with comparable through-hole devices. 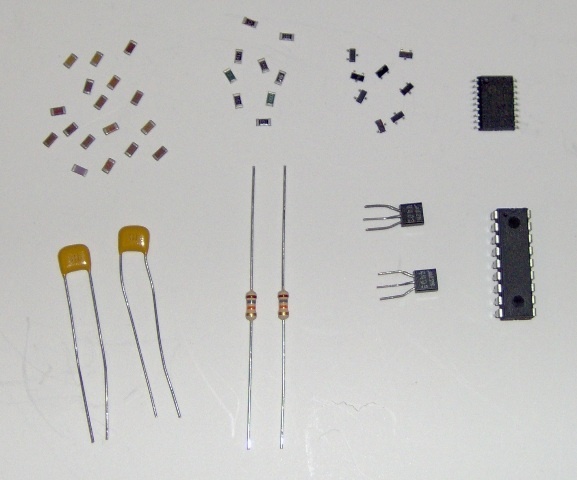 From left to right, we have capacitors, resistors, transistors, and ICs. Both ICs are functionally identical PIC16F648A 8-bit microcontrollers. Building with SMDs costs less. In part this is because SMDs are cheaper, or deliver more bang for the buck, or both. A few years ago I paid around $5 for a basic micro controller. Last week I paid $2 for an upgraded version of that same micro controller in a smaller, surface mount package. SMDs also lower costs because smaller components require less circuit board space, and smaller boards cost less. In some cases SMDs allow the use of a single board where older, larger components required multiple boards. So not only will you spend less for circuit boards, you may also see the cost of connectors and wiring between multiple boards vanish. Though using SMDs can be a big win, the small size can appear to be an impossibly large hurdle. That need not be so. SMDs are manufactured in sizes ranging from “tiny” to “theoretically-visible-but-I-can’t-see-it”. As long as we stay near the larger end of the scale, we can hand solder SMD components using affordable tools and no magic. The relatively large Small Outline Integrated Circuit (“SOIC”) SMD has leads which are 0.05” apart. SOICs are easily hand soldered. The SMD IC in the above picture is an SOIC. 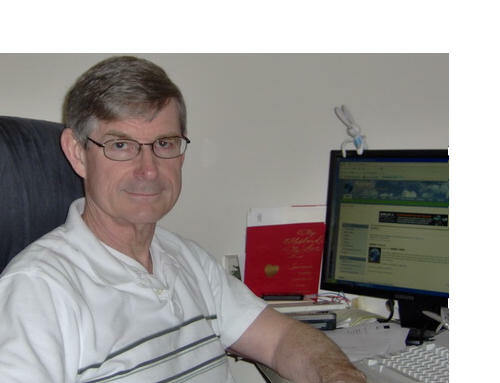 SMD resistors and capacitors have numeral size codes. A “1206” component is 0.12” by 0.06”, about the size of a medium grain of rice. A “0805” component is a bit smaller at 0.08” by 0.05”. Both 1206s and 0805s are easily hand soldered. The capacitors and resistors in the above picture are 1206s. Whether soldering ICs, resistors, or capacitors, the basic approach is the same. First apply liquid flux to the circuit board pads. Apply a small amount of solder to one pad. Position the component on the pads. Heat the component lead/contact resting on the pre-soldered pad until the solder melts and forms a good joint. Solder the lead/contact diametrically opposite. Solder any remaining leads/contacts. 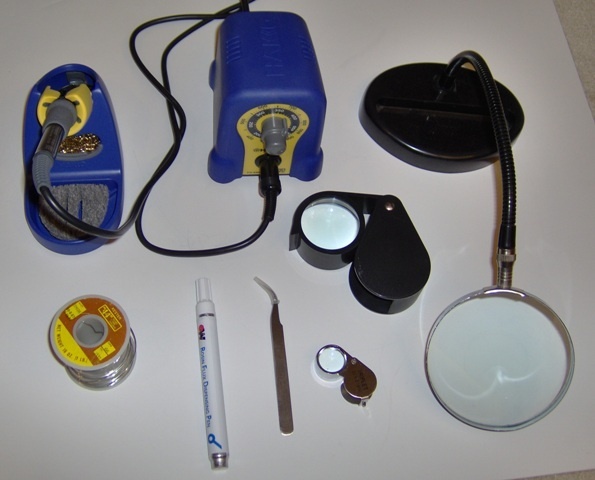 A list of basic tools and supplies starts with a quality soldering station. It’s critical that you have a small tip (0.8mm) with a corrosion resistant coating. (If the tip corrodes solder won’t coat it, the circuit board will melt before the solder does, and your blood pressure will rise dangerously. Get the right tip!) A temperature controlled station is a good idea. The Hakko FX888 is a suitable, moderately priced unit. You’ll need tweezers, curved or straight, whatever you’re comfortable using. Some sort of magnification while soldering is helpful. I’ve used a desk supported 2X magnifier. A head mounted magnifier would work as well. You’ll also need a more powerful magnifier for inspecting individual solder joints. I use both 10X and 30X loupes. You’ll need small diameter wire solder; 0.031” is marginal, 0.020~0.025” is preferable. You’ll also need liquid soldering flux. This is available in bottles and in more convenient “flux pens”.